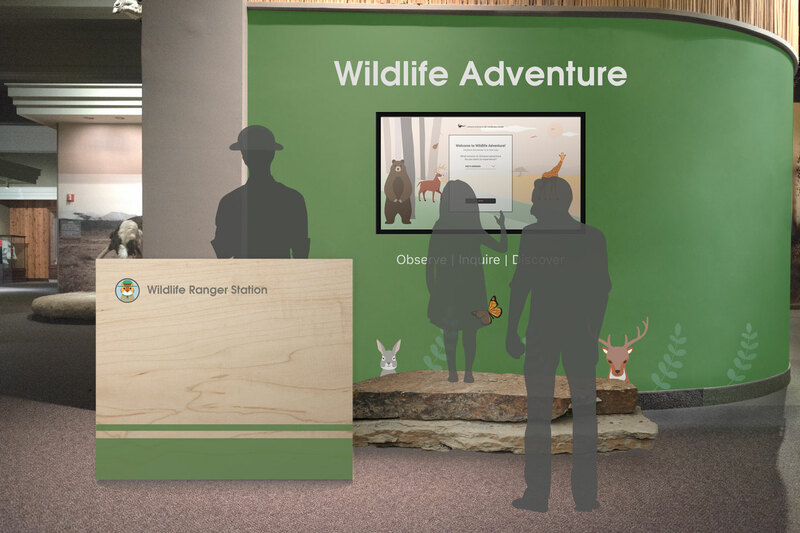 Wildlife Adventure is an interactive activity at Carnegie Museum of Natural History that utilizes augmented reality to allow visitors to discover new information about dioramas and gain a new perspective on how human impacts different ecosystems. The entire project took about a month from conducting research to presenting to Carnegie Museum of Natural History. 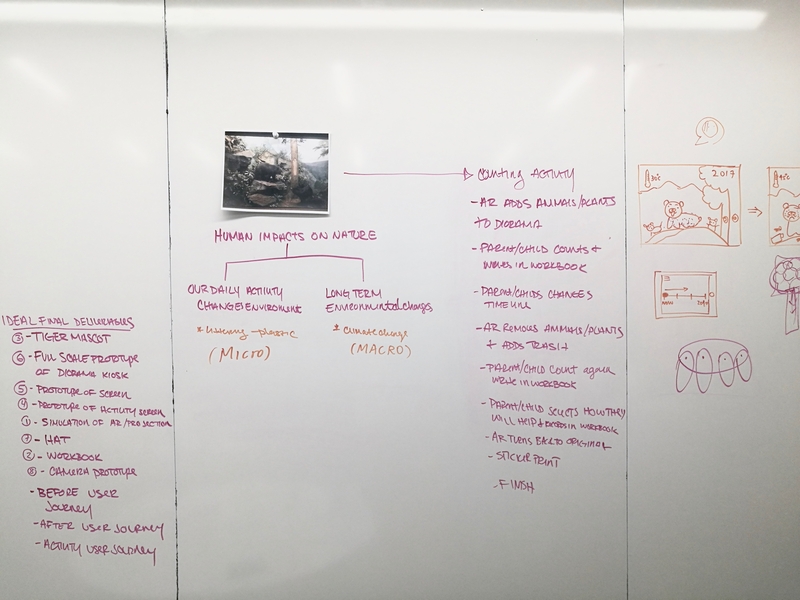 Due to the short period, we only focus on one particular diorama ecosystem to address our concepts. We decided to tackle how invasive species affects the ecosystem as a whole in 15 years in Allegheny National Forest diorama. Parents and children moved at different speeds throughout the exhibition. 40% of families spent 2–5 minutes in the diorama hall, which contains 26 dioramas. What did you find interesting in the museum? Was there any exhibit that was hard to understand from the information provided? What do you wish your child gets out of visiting the museum today? Did you do anything to engage your children while going through the exhibits? We had the opportunity to speak with museum staff who worked in the Education Department. These interviews provided us insight into some of the museum's desires and concerns, such as the importance to preserve the tradition of dioramas and the desire to incorporate the concept of Anthropocene throughout other exhibitions on display at the museum. We also had the opportunity to speak with an elementary school educator to gain a better understanding of the learning process and techniques that are utilized in engaging young children. We started with a very broad idea of educating children about climate change about human impacts. However, there are too many factors to this idea. Then we iterated our concept to macro Impacts vs. micro Impacts about time. 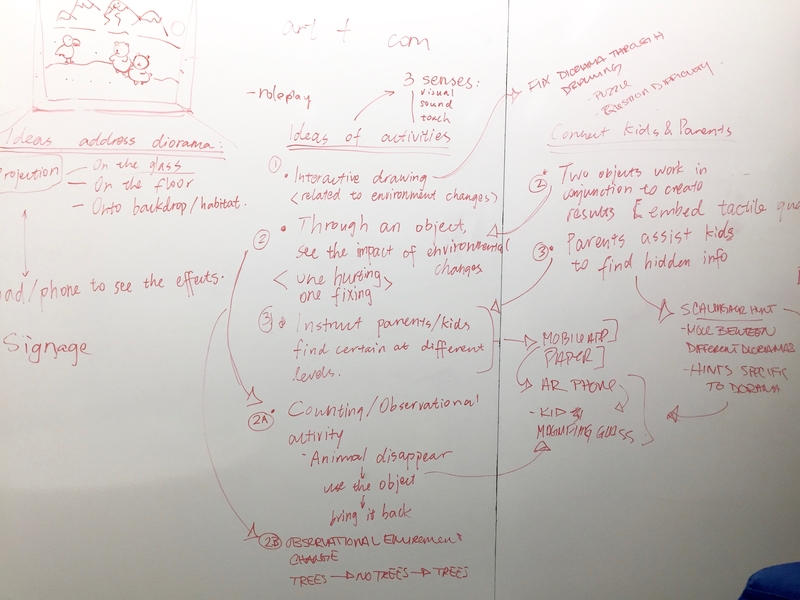 Implementing time element to the design somehow scope down our concept to specific human impacts to the ecosystem. Through our research, we found that invasive species is one of the primary human impacts that influence the ecosystem in animal's habitats. The activity allows the children to control timeline to observe how invasive species affect the environment over time and plege to help for improving the environment. The users first arrive at the center station. Here they are able to select the dioramas they would like to visit and receive the items they will need to complete Wildlife Adventure. They are introduced to Ranger Joe, Wildlife Adventure's mascot, and given basic instructions by a stationed museum employee. At first, we were targeting toward children around 5-8 years old. Our visual style and languages lean to more toddler understanding approach. As we decided to involve parents participating in the activities, our approach shifted to somewhat in between that both parents and children could understand. 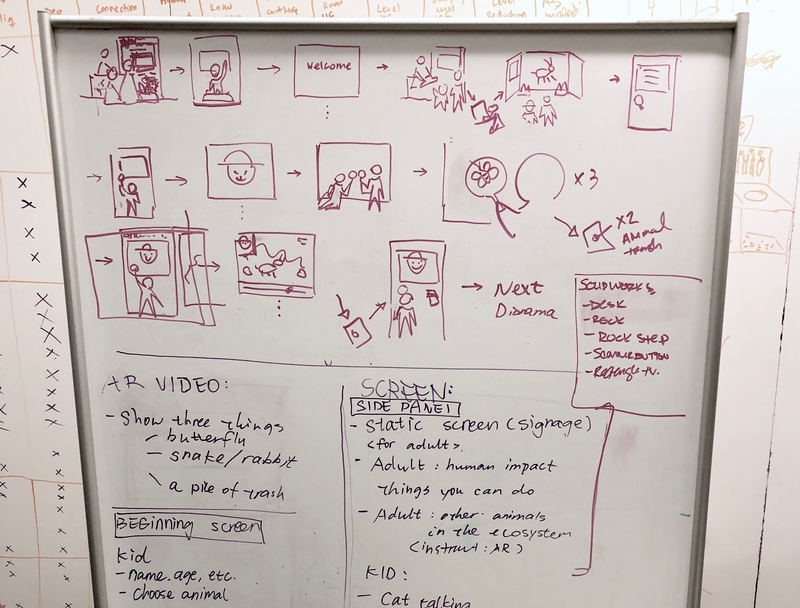 When we were planning our wireframes, we also got feedbacks from elementary school teachers to proofread for the contents and instruction steps. 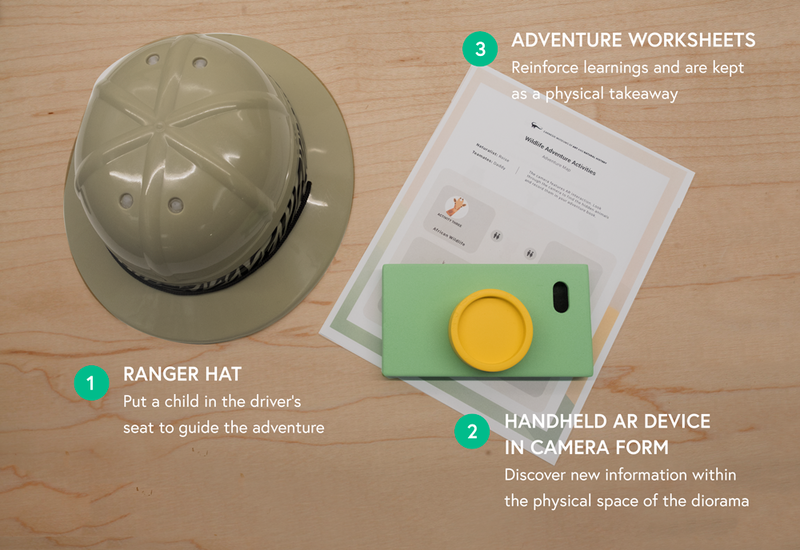 When the child leaves the entry kiosk, she will receive a hand-held AR device (camera), workbook and ranger hat. We wanted to come across the concept of "play" to our idea. When the child activates the AR camera, she will follow the instructions on the screens step by step. After collecting all the animals on the camera, the child will go back to the station to learn more about the specific ecosystem of the diorama. Pledge system will come after the game which the child needs to pledge particular human impacts for improving the ecosystem. 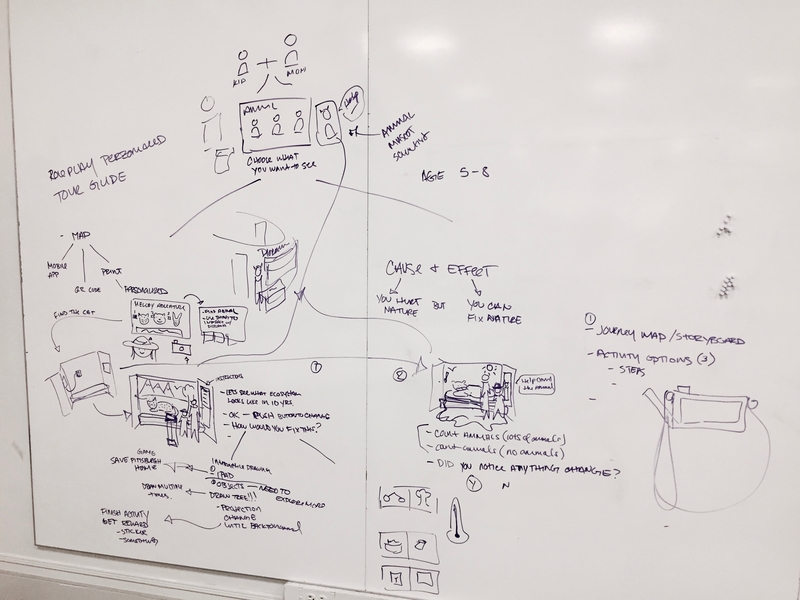 We not only want the children to have digital experience but also the physical workbooks for children to record their findings and thoughts. We view this workbook as a takeaway for children to understand the human impacts on the environment and what can they help to make the situation better in the future. 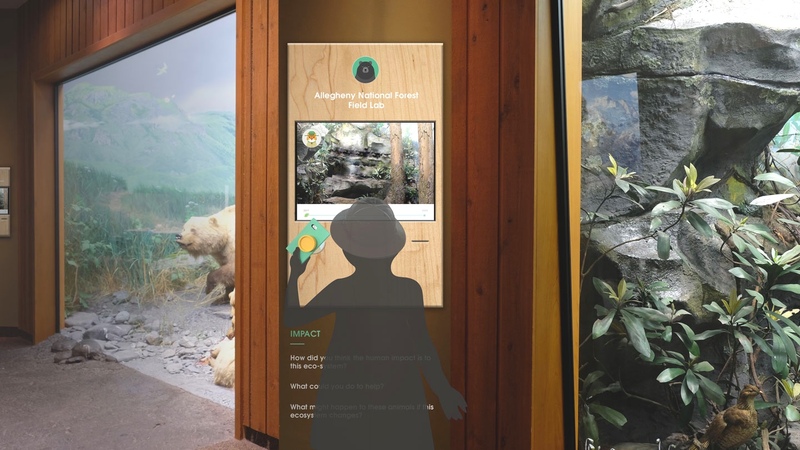 The users, a child, and her parents in this context, should quickly go through the activities smoothly by following the instructions from the animated character (Ranger Joe) and information on individual kiosks. 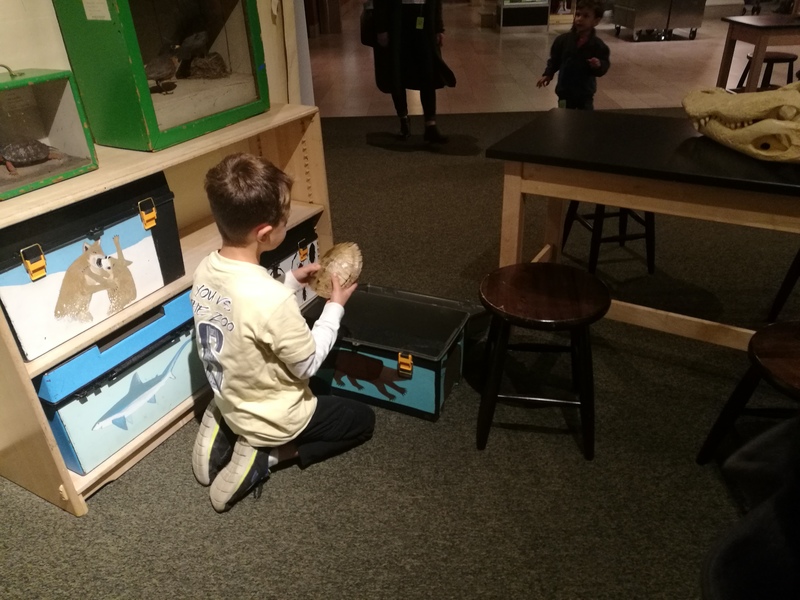 Seamlessly using AR camera to collect animals inside the dioramas and effortlessly navigate through the educational timeline game. 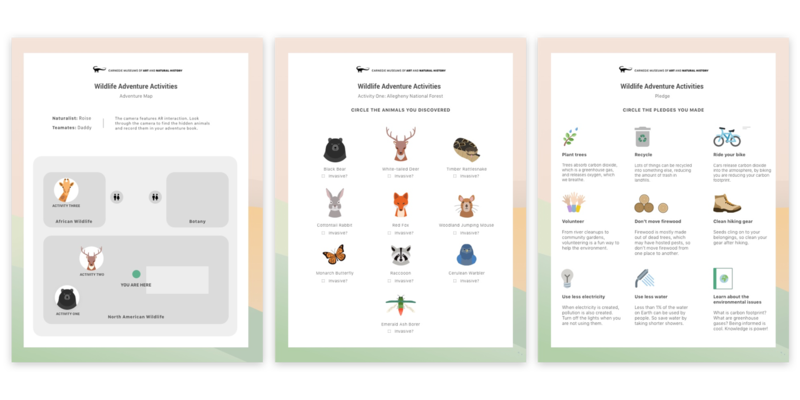 Lastly, by giving the pledge for action and record reflection on the workbook, help children to rethink of human impacts to the ecosystem and bring awareness of make the situation better. 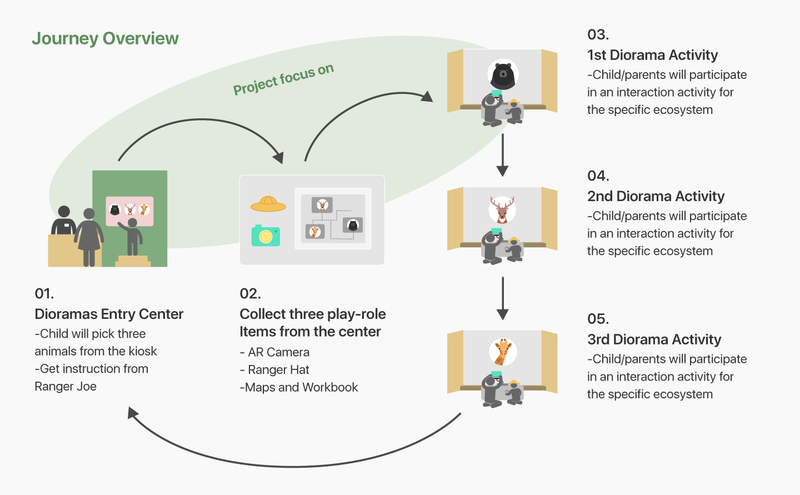 The interface of individual activity flow and instruction have to be user-friendly and easy to understand so that the family will have a fun time exploring the dioramas and.pormote more meaningful conversation between the child and parents. To increase engagement for both children and parents, we design a playful and colorful interface for children to customized their museum journey. With animated character (Ranger Joe) as an instructor, this will boost children motivation to continue exploring the activities. 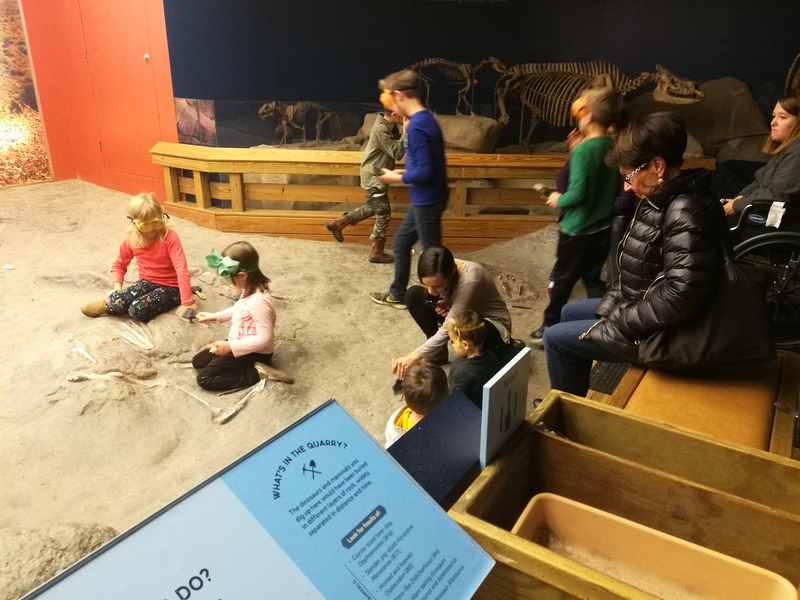 The museum is a place to have fun, but it's also a great place for informal education. Children will learn information about human impacts and the ecosystem in-depth by engaging in our educational timeline game. 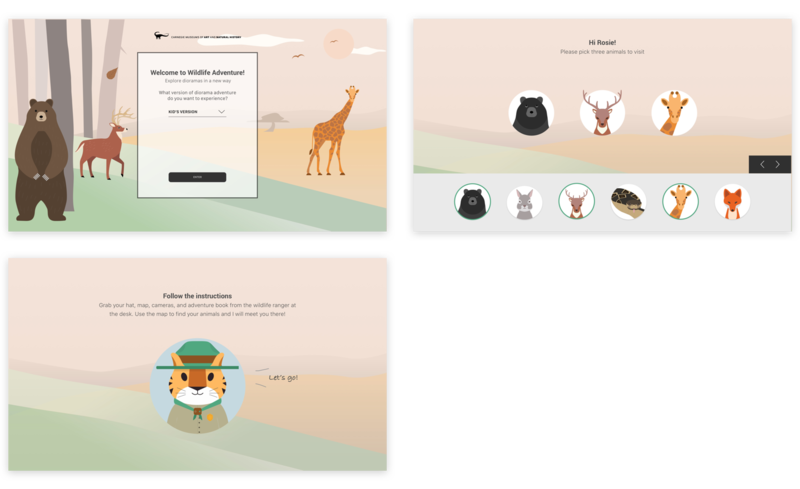 The user is taken to a pledge page where they are promoted to select a way they will help the environment. A pledge system helps relate the human impact information we are introducing back to the user. For each activity, the pledges relate to the specific human impact that is introduced. This also helps to promote meaningful conversation between parents and children. Leveraging how AR technology could play an important role to make the museum experience more playful and interactive. 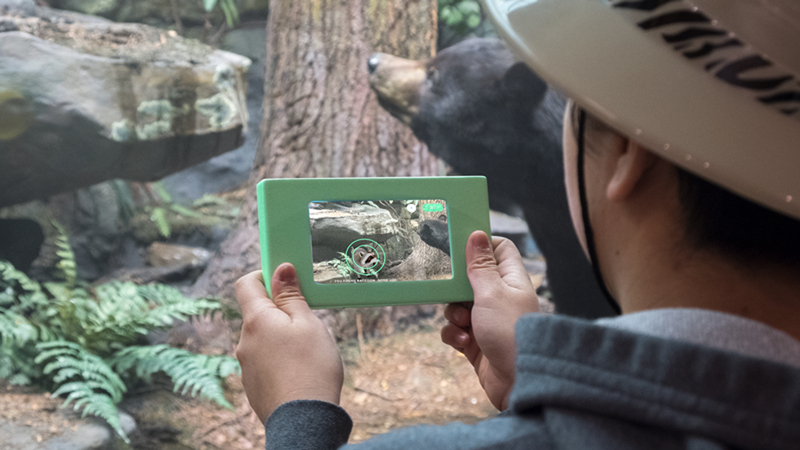 We apply AR technology for children to collect hidden animal within the diorama. IChildren will be able to record their thoughts and findings in their workbook. It is a takeaway for both children and parents to reflect their perspectives together after leaving the museum.